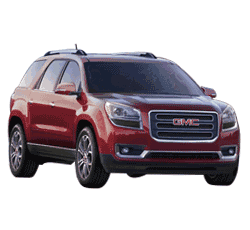 The 2014 GMC Acadia can do just about everything that is asked of a modern day large size crossover vehicle. The Acadia will transport an entire family (and then some) to social functions, haul large loads and maneuver through urban areas with surprising ease. It really is a mixture of a minivan and a stylish sport utility vehicle. The Acadia seats a total of 8 with the use of a second row bench seat and second row captain's chairs. The Acadia is sold in a variety of trims: Denali, SLE, SLT, SLE-1, SLE-2, SLT-1 and SLT-2. Each trim comes with a six speed automatic transmission. Front wheel drive is standard though buyers can choose to upgrade to all wheel drive. The Acadia re-enters a very competitive large crossover segment that includes the Chevy Traverse, Buick Enclave, Nissan Pathfinder, Hyundai Santa Fe, Mazda CX-9, Dodge Durango and Ford Flex. The Acadia is most similar to the Traverse and Enclave in terms of its seating capacity, engine and intended functions. The Traverse is the cheapest of the three but the Enclave is a bit more luxurious and feature packed than the Traverse and the Acadia. The Acadia is just as aesthetically pleasing as the Enclave and starts at a MSRP of $34,485 compared to the Enclave's $38,890. So, drivers will have to shell out nearly $5,000 more for the Enclave's few extra bells and whistles. The Flex is a solid competitor and the CX-9 has amazing handling and a spacious interior. The Durango, Santa Fe and Pathfinder are affordable yet they lack the passenger and cargo space of the larger Acadia. Overall, the Acadia presents one of the best values in its class, especially for families that need a vehicle that seats 6 to 8 people. The new Acadia sees just a few minor improvements in 2014. There are now two extra charge-only USB ports added to the backside of the vehicle's center console. The Denali trim comes with a lane departure warning system as well as forward collision alert. The ride is much quieter thanks to the Acadia's new dual flow damper shocks. 1) The Acadia is enormous in terms of passenger seating and cargo space. Up to 8 people can sit inside and there's 24 cubic feet of cargo space. Once the third row seats are folded, cargo space becomes 70 cubic feet. If the second row is also folded, cargo room extends to an amazing 116 cubic feet. 2) The 6 cylinder, 3.6 liter, 288 horsepower engine with 270 pound feet of torque allows the Acadia to transport heavy hauls with ease and tow an impressive 5,200 pounds. As noted below, the Acadia's only performance concern comes when the driver asks the vehicle to make a swift pass. 3) The lower end SLE-1 trim has several useful features like satellite radio, Bluetooth, OnStar, keyless entry, a rear parking sensor, a rear view camera and more. 4) The SLE-2 steps up the amenities even more with niceties like remote start, a power liftgate, an auto dimming rear view mirror, an 8 way power adjustable driver's seat and smartphone app integration. 5) The SLT-1 provides even more impressive features like rear seat audio controls, heated front seats, heated mirrors, fog lamps, three zone automatic control, variable effort steering and a 10 speaker Bose stereo. 6) The SLT-2 offers unique functions like cargo space audio controls, power folding mirrors, driver memory functions and ventilated front seats. 7) The Denali has the SLT-2's amenities along with gorgeous 20 inch chrome wheels, a panoramic sunroof, a steering wheel with wood trim and an optional navigation system. 8) According to Edmunds, the Acadia zoomed from 0 to 60 mph in only 8.6 seconds. This rate of acceleration is better than the majority of large sized crossover vehicles. 9) The Acadia is safe instead of sorry. It boasts anti-lock disc brakes, rear parking sensors, a rear view camera, side curtain airbags and front seat side impact airbags. The SLT-2 and Denali trims come with blind spot monitoring and cross traffic alerts. All of the Acadia trims except for the SLE-1 provide center front airbags that provide extra protection for the driver and front seat passenger during side impact accidents. 10) The Acadia comes with a very helpful OnStar support system that provides remote door unlocking capabilities, stolen vehicle location, on demand roadside assistance, an emergency button and automatic crash notification. 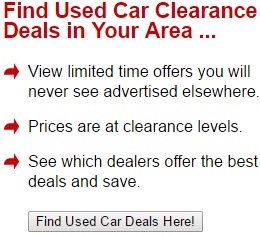 1) An all wheel drive Acadia only attains 16 mpg in the city and 23 mpg on highways. That is a low figure in general but not terrible for a large size crossover. 2) Some drivers complain that the Acadia's IntelliLink system sometimes struggles to process presses to its touch screen. 3) While those seated in the first and second rows will be quite comfortable, passengers in the third row will find that the middle row's seats are placed too low, compromising their room. The second row seats can slide back but it is difficult to find the slide release and the sliding process eradicates third low leg room. 4) Those seated in the third row seats will find them to be far too small unless they are kids or short and skinny adults. 5) Auto critics have noted that in comparison to other large crossovers, the Acadia feels a bit stiff when drivers attempt to drive it in confined spaces like parking lots. 6) When Acadia drivers attempt to pass slower vehicles, the six cylinder engine doesn't always meet expectations. When asked to “get up and go”, it often feels a bit sluggish and can create unsavory sounds. Yet many large crossover owners consider this slight fault to be characteristic of most gigantic vehicles. It is an acceptable shortcoming considering everything else that the Acadia offers. The Acadia offers an affordable transportation option for large families that need significant space. Thankfully, it does so without sacrificing steering precision or ride quality. The criticisms of the Acadia are few and far between. It isn't exactly the most beautiful and stylish large crossover on the market but most prospective Acadia buyers aren't looking to wow onlookers. The vehicle is all about function with just enough focus placed on its form. This balance makes the Acadia one of the best large size crossover vehicles in 2014.